Yet another publication ran a story about the integrated system we installed at our 7th Buffalo Wild Wings location in New Jersey. Dealing with a large franchise has it’s own challenges, Serious Audio Video is proud of the aesthetically pleasing and user-friendly designs we create for each unique location. Once you’ve installed complete control and audio/video solutions in seven nearly identical restaurants, it can start to seem like a cookie-cutter operation. 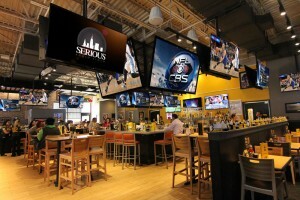 For Union City, N.J.-based Serious Audio Video, however, the eighth ELAN control installation in a Buffalo Wild Wings location was anything but standard.